A postable Gift Tin containing a jar of preserves, 2 varieties of tea (pyramid tea bags), sugar hearts and an etiquette tips booklet! A postable red Gift Tin (which can be used as a tea caddy too) containing a 113g jar of luxury preserves, 2 varieties of tea (pyramid tea bags) - English Breakfast and Afternoon Tea with a hint of Citrus, very charming Sugar Hearts and an etiquette tips booklet! A charming gift! Great 'hostess' treat as a thank you for dinner etc. Our new Home Bake Scone Tin contains everything for tea time treats except for the cream. See the video below too. 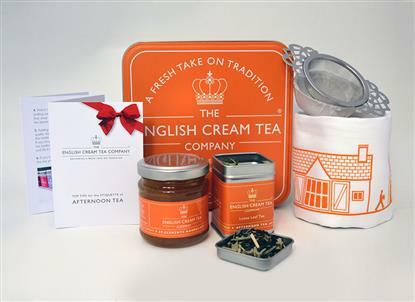 A lovely orange postable tin containing loose leaf tea, St Clements Marmalade, tin Tea Strainer and UK made cotton Tea Towel. Nice!